Noted pain management authority Steven D. Waldman, MD, JD, and Robert Campbell, MD, a well-respected radiologist at Royal Liverpool Hospital in the UK, have combined their expertise to bring you Imaging of Pain. 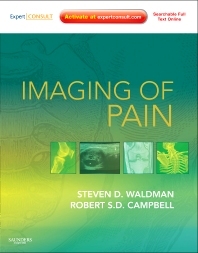 This first-of-its-kind reference helps you select the most appropriate imaging studies to evaluate more than 200 pain conditions so you can implement the most effective management approaches. You’ll gain a clear understanding of how and when to use a given modality for a particular pain disorder, whether it involves bone, soft tissue, or the spinal cord. At expertconsult.com you'll access the complete contents online, fully searchable, with links to Medline and PubMed abstracts, for rapid, easy consultation from any computer. Access the fully searchable text online at expertconsult.com. Get the most definitive guidance available from leading authorities Drs. Waldman and Campbell. Know how and when to use each modality to confirm or deny a diagnosis for more than 200 pain conditions in all body regions. Provide the most effective pain relief by accurately identifying its underlying source. Find the information you need quickly thanks to a consistent, high-yield format. radiologue, Royal Liverpool Hospital, Royaume-Uni.